Whew. What a day. I spent Saturday morning and afternoon with my sister and brother-in-law cleaning out the house we move in to in two weeks. Arrrgh!! Two weeks! If it wasn't for them I would be in full-on panic mode. Crouched in a corner shivering and sobbing. Not only did they take several pieces of furniture but they hung around and helped clean out a lot of stuff. A lot. They even found a home for a sofa. Thank you, from the bottom of my sanity. Has anyone else scheduled a move into a house that was already full of furniture? If you have, you'll know how I feel. You'll note I haven't said "we." It's not that my husband hasn't been doing (way more) than his fair share. He works weekends. AND he's been dealing with packing up and getting rid of stuff from the house in the city. I can't say how much I love and appreciate him for all he does. So we all were busy. Thank goodness I made a recipe that did most of then work while I was asleep. I was overnight rising bread again. 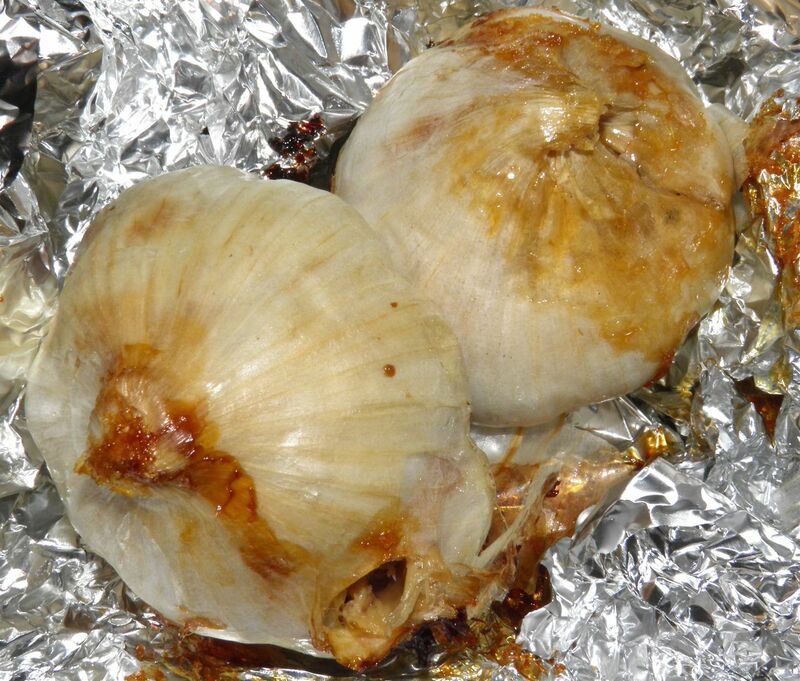 This one is an olfactory delight from the start when you roast the garlic, to well after it comes out of the oven. 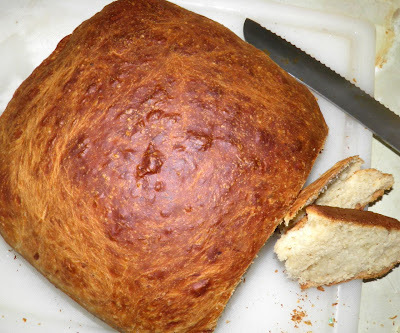 This is not a large loaf, but it packs a punch. 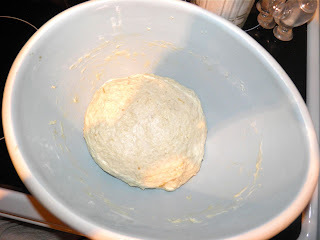 I made it flat, but it could be done in a regular bread pan. The result will be taller. This loaf has two whole heads of garlic in it. Buttery, rich, roasted garlic. 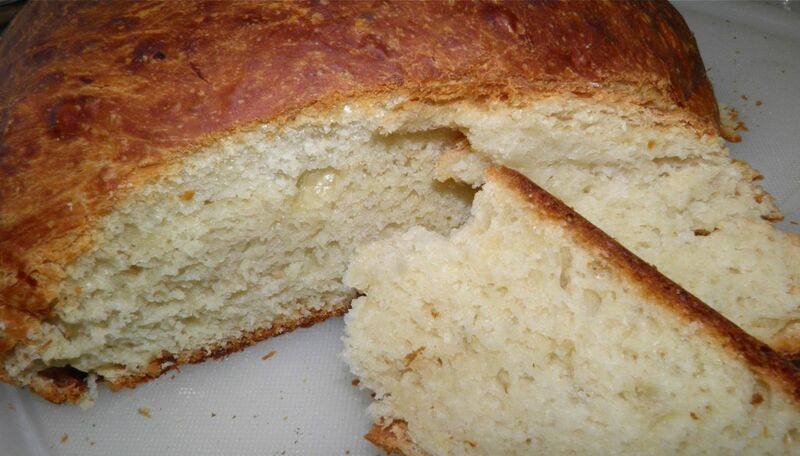 People often say to me they don't have time to make bread. To them I say "pooh pooh." If you have time to sleep you have time for bread to rise on the counter. The only hitch with thisloaf is you have to roast the garlic beforehand. No big deal. Then you just mix everything together and go sit in front of the Tv before toddling off to bed. In the morning you're ready to flop it into a pan and slap it in the oven. This loaf tastes great. If I want a snack tonight I think I may try it as a grilled cheese. Can you imagine? I can. What you'll find in the morning. 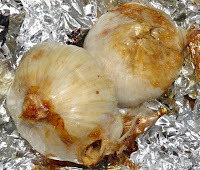 Place the whole heads of garlic on some tin foil. If you want you can trim the tops. It makes squeezing out flesh out a little easier. Drizzle the tops with olive oil, wrap tightly and bake at 400°F for one hour. Let cool before handling. Melt the butter while the garlic are cooling. Combine all the dry ingredients in a large bowl. Stir well and then add the water. Mix together until ragged. Then squeeze the garlic cloves into the bowl and then pour in the butter. Mix with your hands until you can't see any large pieces of garlic. It may take 2 minutes. 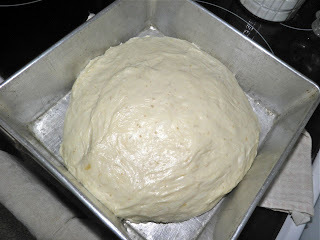 Cover with plastic wrap and a towel and let rise overnight on the counter. In the morning grease whatever pan you will be using. 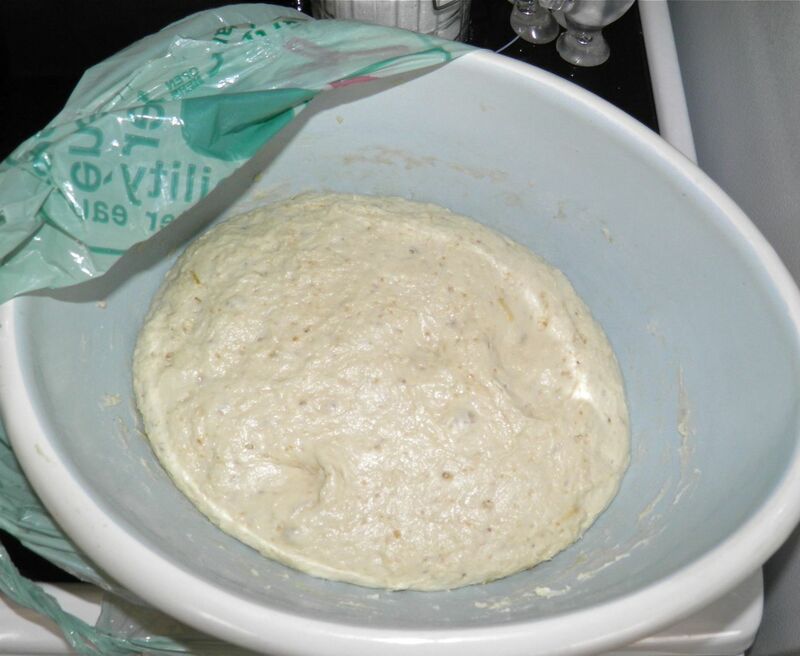 Put the dough in the pan and let rest for 30 minutes. Preheat the oven to 425°F. Bake the loaf for 40-45 minutes until it is well browned on top and sounds hollow when tapped on top. Let cool, if you can. Gild the lily by slathering with butter while still slightly warm.